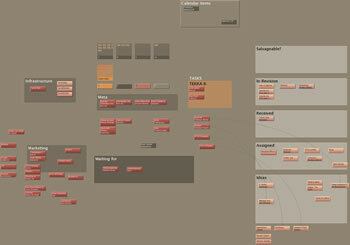 Today, I wanted to take a short time-out and look over a bunch of editoral ideas for TEKKA. We're just finishing TEKKA 6, and TEKKA issue 7 is already looking pretty solid. But what about TEKKA 10, say? What should we be talking about next summer, and whom should we want to talk about it? This is classic whiteboard territory, except that we all know that no whiteboard is ever going to be big enough. That's one of the nice things about Tinderbox -- it gives you an enormouse, scrolling whiteboard. One of the nicest things about Tinderbox for this task is that you can pick up and move things. Real whiteboards get smudgy partial erasures when you try to reorganize. Another nice thing: you can open each box and get a nice text window for notes. When an idea originated in an email note, I simply dropped the email inside the box -- just in case I want to refer to it later. There are 87 things in this map — a lot for a whiteboard, but a piece of cake for Tinderbox. I can share the real thing with the TEKKA staff, even though they're all over the world. And I can share the picture of the whiteboard with you, right here on this weblog. Sharing is fast. I'm using a few bits of Tinderbox magic to lend a hand here. You can't see them at this distance, but ideas about fiction have thin red borders, while ideas about reviews have thin blue borders. Near the top, I've got agents that automatically collect articles that are pencilled in for upcoming issues. Links connect tasks (darker red boxes) to article ideas (lighter boxes), so things stay connected and information doesn't get duplicated. Not bad for a side-effect of a brainstorming session.